Bring your milk to a simmer, or scalding as grandma use to say, 185 degrees if you’re keeping track. Let the milk cool to around 117 degrees. Over 120 will kill the culture, under 110 will slow down the process. Add the culture. I use a special insulated container to house my batch of yogurt, but you can use a sink full of 117 water, a cooler filled with the same water, or all manor of methods to keep your yogurt at temp (even a water bed.) Let it sit undisturbed for 8-24 hours. I go for 24 hours because I’m lazy, but this does tend to produce a more sour product. 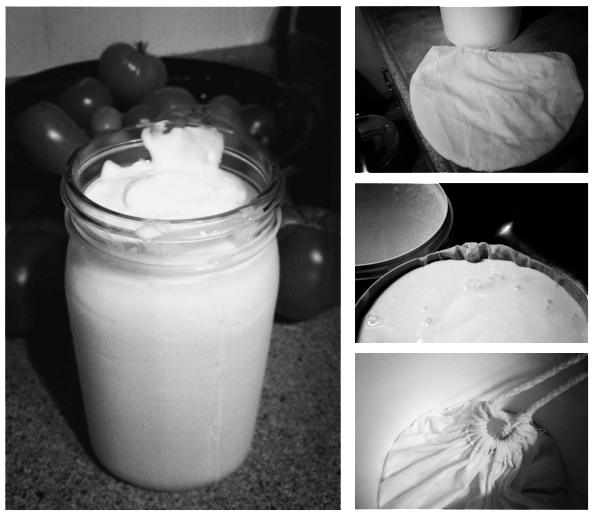 You can use lowfat or nonfat milk, but it won’t be as thick, nor will it produce as much strained yogurt. It also tends to be very sour. For a real treat, try making a scaled down version with cream. OMG. Refrigerate your yogurt for another 24 hours, then pour into a colander lined with fine muslin, fine dishtowel or a clean handkerchief. Let strain on the countertop, unrefrigerated, for about 8 hours or overnight for Greek-style yogurt, or 24 hours for spreadable yogurt cheese. Refrigerate. Greek yogurt is great to use for breakfast, in dips, marinades, pancakes and dressings or as a good substitute for sour cream.